There is no more representative symbol of Seville’s layered history than the 322-foot (98-meter) Giralda Tower (El Giraldillo). The bell tower of the city’s cathedral stands a little apart from the main building; it was once the minaret of a mosque that stood on the site before it was razed to make way for the cathedral. Giralda Tower, with its added baroque lantern, belfry, and bronze weather vane, is one of Seville’s most notable landmarks, and is often included as a stop on city sightseeing tours. Most visitors choose to climb the tower to a viewing platform some 230 feet (70 meters) up via a series of 35 ramps, originally built so that guards could access the tower on horseback. The panoramic views over the city are well worth the climb. 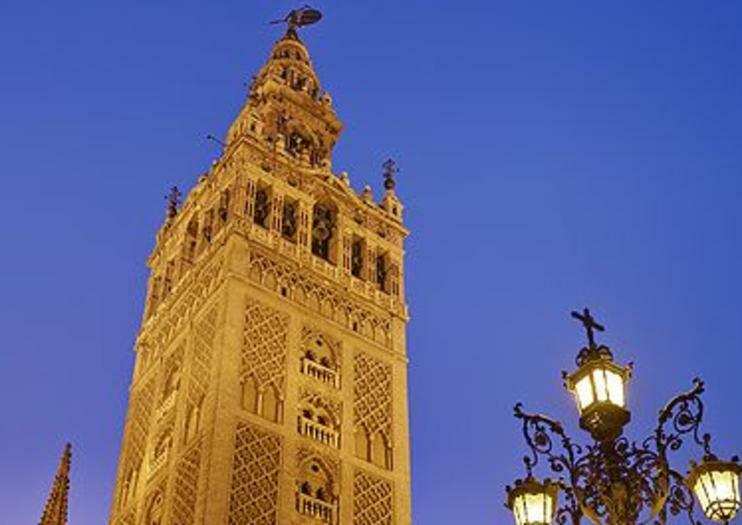 The Giralda Tower is a must-see for photographers and first-time visitors to Seville. Wear comfortable shoes suitable for walking over uneven surfaces, and be prepared to climb up fairly steep ramps. Don’t forget to bring sunglasses, sunscreen, and a hat for enjoying the sunny observation platform. While parts of the cathedral of Seville are accessible to wheelchair users, the tower is not. La Giralda stands just next to the Seville Cathedral (Catedral de Sevilla) in the Centro Histórico, a few blocks from the bullring by the Guadalquivir river. To get there by public transportation, take the light rail to Archivo de Indias station. The tower and cathedral are open daily, but hours vary widely depending on the day of the week. The best weather for enjoying the tower and Andalucia’s other outdoor attractions comes in spring (March to May) and autumn (September to November). Expect temperatures to soar to 95°F (35°C) during the summer months. The Giralda Tower isn’t the only point of interest within the Seville Cathedral. The 15th-century Gothic cathedral—one of the world’s largest—also houses a collection of religious art, the tomb of Christopher Columbus, and the world’s largest altarpiece depicting more than 1,000 carved biblical figures. Among the masterpieces on display within the cathedral are Santas Justa y Rufina by Francisco de Goya, Pedro de Campaña’s El Descendimiento, and La Inmaculada by Spanish baroque painter Bartolomé Esteban Murillo.